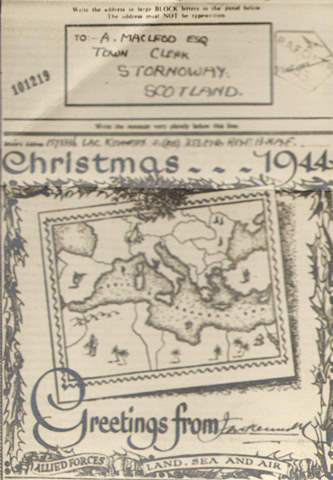 This greetings card from Christmas 1944 was sent to Mr Macleod, the town clerk of Stornoway during WWII. It appears to have been sent from a member of the armed forces as thanks for the work carried out by the Town Clerk as part of the war effort. I particularly like the little palm trees and sand dunes that decorate Northern Africa! This entry was posted in Uncategorized and tagged Christmas, Friday Photo, Stornoway Town Hall. Bookmark the permalink.